A popular species for the sport fishing crowd, this bass is light colored with one or more blotches on its side. 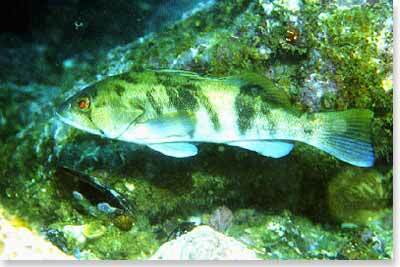 The sand bass will often be seen in areas where the bottom has both rock and sand. The species ranges from Santa Cruz to lower Baja California. Reportedly growing to lengths of 26 inches, individuals are rarely seen over 18 inches. Juveniles prefer to dine on bottom- dwelling invertebrates, while the adults concentrate on smaller fishes and octopus. The barred sand bass spawns during the summer months and can often be seen in large groups at that time of year.